On this page I will try to reconstruct the LNW model history. As complete as possible with model pecularities. The pictures are scans of 80Micro advertisements from July 1980 to September 1984. This is a Tandy Model 1 Expansion Interface clone. The main differences is a on board power supply. The serial interface baud rate generator is not software switchable. The System Expansion was available as a kit (from January 1980 or before, left) and completely built in a solid steel case (October 1981, right). 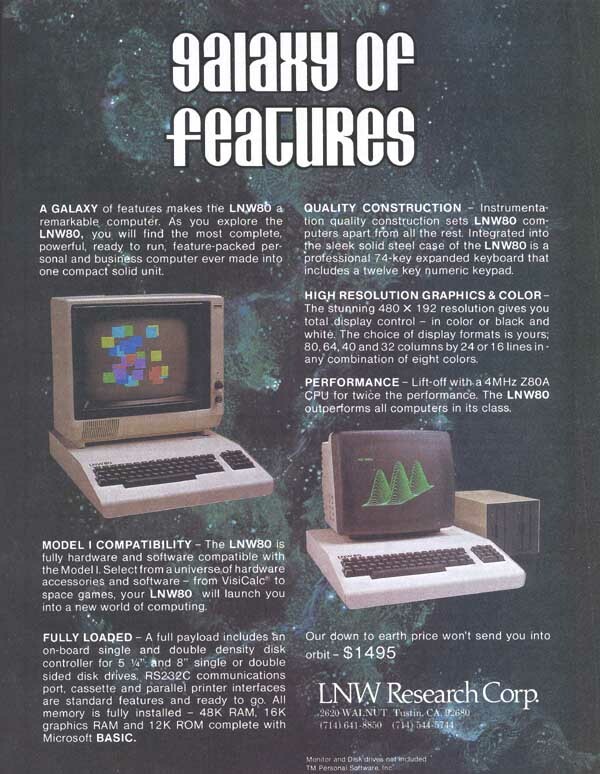 The first advertisement of the LNW 80 computer appeared in the November 1980 issue of 80 Microcomputing. 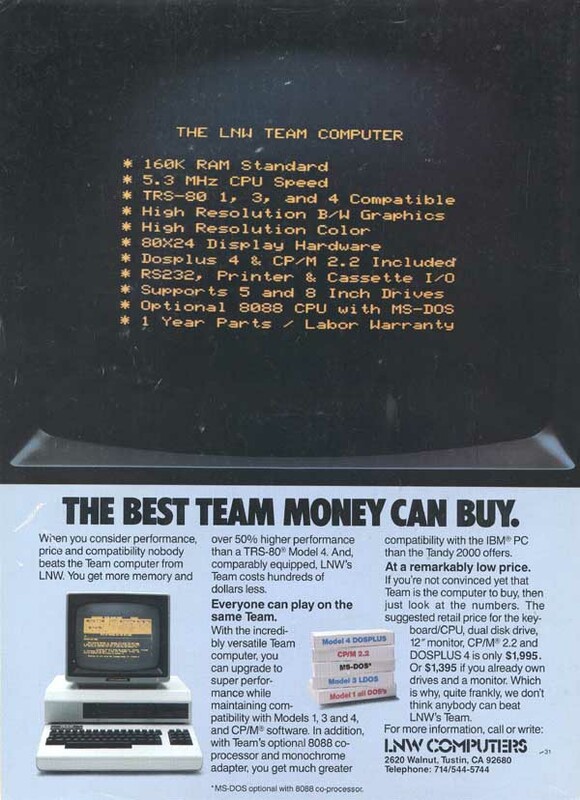 The LNW80 computer main board contained the TRS80 model 1 functionality at 1.77 or 4 MHz processor clock and hires video and color support. The keyboard included some extra keys (control, caps lock, F1, F2, reset). Sandwiched on the mainboard fitted the System Expansion board containing the TRS80 Expansion Interface funcionality. An LNDoubler completed the set. The color add appeared first in January 1982, and was the back page of 80 Micro since September 1982. The model 1 was also available as a kit. 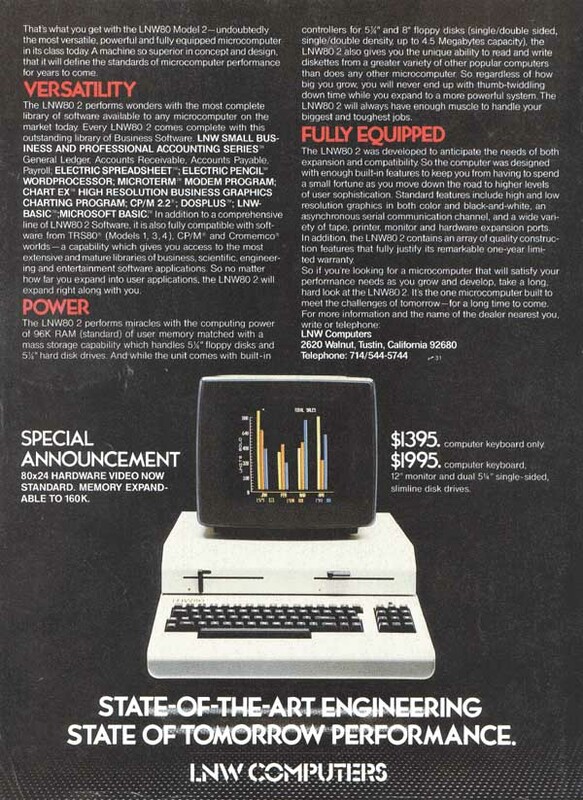 In fact a picture of the case was shown in an ad on January 1981 the first time. 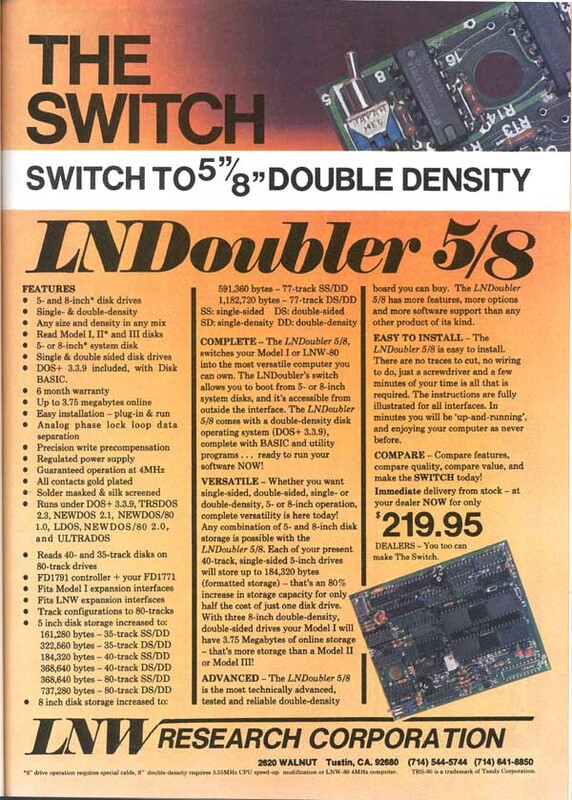 The LNDoubler is a Double density controller for the TRS80 model 1 and compatible computers. The board is placed in the socket of the 1771 floppy controller chip, and the 1771 is placed on the LNDoubler board. It is compatible with the Percom doubler, but has a analog phase locked loop and it supports 8" disks. A switch made 8" disks bootable! This ad appeared first in October 1981. 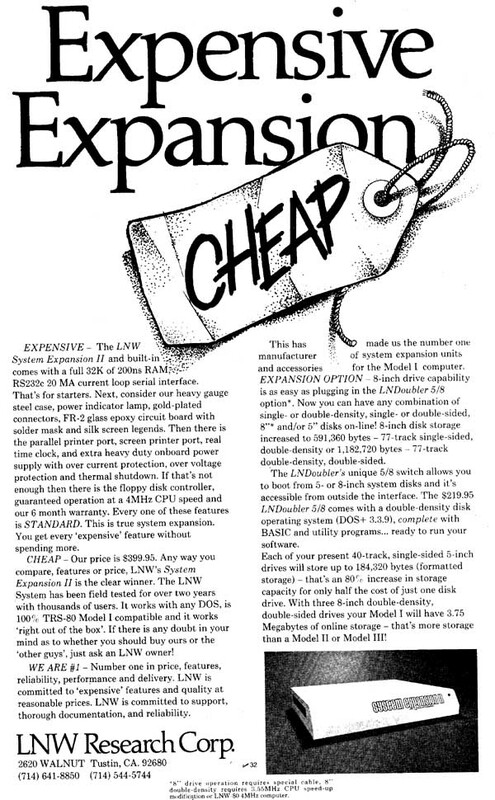 In January 1983 LNW started advertising the LNW II in the 80Micro. The LNW II had a memory switching option allowing it to run CP/M. The hires option was used to get an 80x24 character display. The rest of the machine was probably equal to the model 1. The LNW80 II came with two disk drives in a case derived from the System Expansion II. No standard floppy drives, but floppy sized slits and handles in a metal housing. This cool but rather expensive design was dropped for standard floppy drives in the LNW Team. 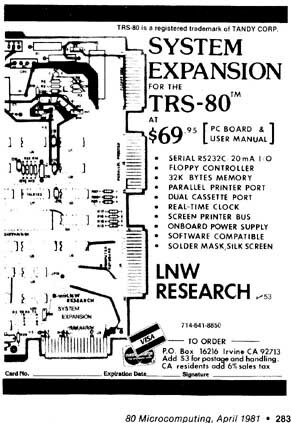 July 1983 LNW starting advertising the LNW Team computer. This machine included 160K Ram, 5.3 MHhz CPU clock and 80x24 display hardware. A 8088 board was optional. With the 8088 option, the system could run MS-DOS (probably a dedicated 2.x version). This board may be similar or even equal to the Micro Merlin (for a description see Pete Cervasio's TRS-80 Model 1 page). 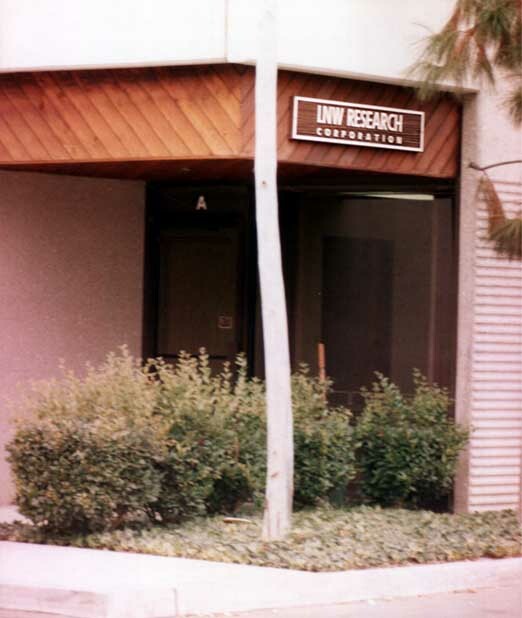 September 1984 was the last 80Micro containing an advertisement of LNW Research. If you want to know what happened, see Dallas Hodgson's Retro Computer Page.